NETWORK FINALS: CBS’s NCAA TOURNAMENT coverage adjusted to 1.5/1.0/1.7, below last year’s 1.9/2.0/2.7 for the parallel night. Elsewhere, GREY’S ANATOMY gained 0.1 in final numbers. CABLE HIGHLIGHTS: It was another NCAA TOURNAMENT night, so TBS had the night’s Top 4 slots, led by the Purdue vs. Tennessee game at 1.42. Fox News’s TUCKER CARLSON TONIGHT had the cable news lead at 0.36/0.62/3.8M, with MSNBC’s RACHEL MADDOW SHOW at 0.19/0.32/2.5M, and CNN’s CUOMO PRIME TIME at 0.16/0.20/1M. ESPN’s MLB opening day game was at 0.35 (branded as “SUNDAY NIGHT” for contractual reasons), and afternoon games were at 0.23/0.19. 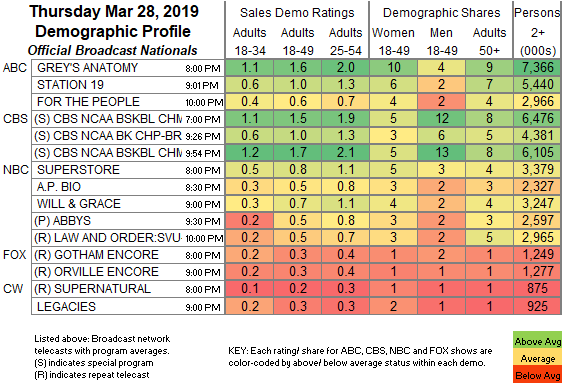 Tru’s IMPRACTICAL JOKERS returned at 0.30, and the lead-out premiere of TACOMA FD was at 0.22. On History, SWAMP PEOPLE slipped 0.02 to 0.30, and TRUCK NIGHT IN AMERICA was down a tick to 0.27. On MTV, EX ON THE BEACH dropped 0.07 to 0.29, and GAME OF CLONES was down 0.03 to 0.11. On ID, KILLING TIME was at 0.28, and DEAD OF NIGHT was steady at 0.23. Food Network’s BEAT BOBBY FLAY ticked up to 0.28. On VH1, RUPAUL’S DRAG RACE lost a tick to 0.27, and UNTUCKED was down 0.03 to 0.19. HGTV’s CARIBBEAN LIFE was at 0.26/0.20, HOUSE HUNTERS INTL shed 0.05 to 0.23, HOUSE HUNTERS fell 0.06 to 0.21, and FLIP OR FLOP was at 0.21 compared to last week’s 0.23/0.28/0.28. A&E’s FIRST 48 gained 0.04 to 0.26. Lifetime’s LITTLE WOMEN returned at 0.23. 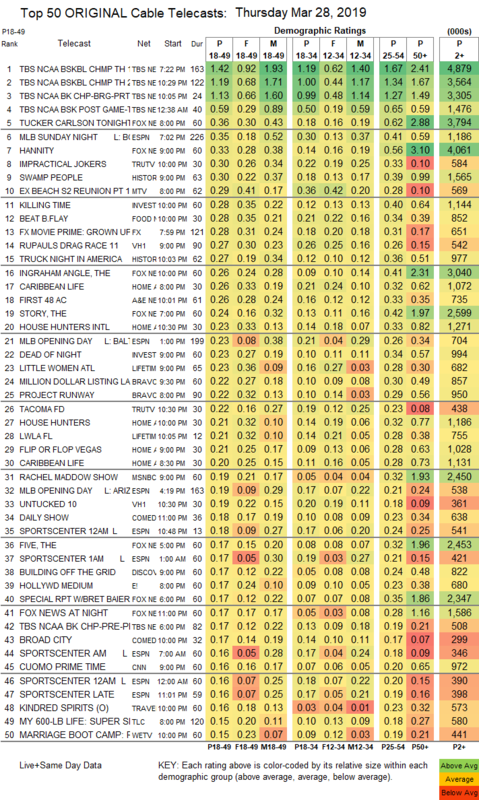 On Bravo, MILLION DOLLAR LISTING was stedy at 0.22, and PROJECT RUNWAY ticked down to 0.22. Discovery’s BUILDING OFF THE GRID dropped 0.06 to 0.17. E!’s HOLLYWOOD MEDIUM was steady at 0.17. On Comedy Central, the series finale of BROAD CITY rose 0.03 to 0.17, and the season finale of THE OTHER TWO was steady at 0.09. On We, MARRIAGE BOOT CAMP lost 0.06 to 0.15, and BRAXTON FAMILY VALUES returned at 0.07. FX’s BETTER THINGS climbed 0.03 to 0.13. The season finale of POP’s FLACK dropped a tick to 0.01/36K.